Sometimes, existing knowledge just does not translate well when things change. And, having worked hard to obtain that knowledge, people are sometimes reluctant to let it go. This seems especially true in libraries. Some of the convoluted procedures and jargon we come up with are not just barriers to entry for new patrons, but also barriers to evolution for experienced patrons who have learned our complex requirements. patron: Is there any way to interlibrary loan a downloadable audiobook? This question makes me laugh just because it's such an unusual idea - right on the border between clever and naively optimistic. As clever as this might be, it also sounds like someone trying to circumvent the system - which always bothers me. But too, it could just as easily be a case of the system failing the needs - if we can freely share books, magazines, videos, CDs, DVDs, and pretty much everything else in the collection, why can't we share digital audiobooks? Such strict copyright laws exist for electronic media (which laws covering other media don't even approach in restrictiveness) that it's frustrating to me to see this shortcoming. What this patron wants is possible with current technology, but is prohibited by the current business plans of corporations. But even still, the idea of interlibrary loaning a digital audiobook is interesting. Aside from the file size, why shouldn't libraries be able to loan around their digital audiobook collections? They could be emailed or made available in a password-protected section of our website. This is another case where, if libraries banded together and spoke with one voice, we could possibly force change so we can get the tools we need to best serve patrons, rather than just take the tools that vendors develop. Like with opacs - as companies like Sirsi/Dynix decide to drop entire product lines [pdf], librarians are developing tools like Evergreen and Scriblio (formerly WPopac) that actually address the needs that exist, not just make sense in a boardroom. One of my coworkers was recently recognized by the Northern Massachusetts Regional Library System (NMRLS) for his work in making library life easier. Chris Kupec (Assistant Director at Chelmsford) and Dean Baumeister of the Memorial Hall Library in Andover, MA, developed some free software to make the printing of routing slips possible for libraries using SirsiDynix's Horizon product. To understand the benefit of this, you really need to get into the nitty-gritty of working at a circulation desk. But the bottom line is that this software literally saves hours worth of effort each day. The software automatically prints routing slips that accompany books for interlibrary loan requests, which is a huge improvement over the prior method of writing out a slip by hand. There's been some buzz about this project for awhile, and it is slowly spreading throughout our consortium and the rest of the state. We've had it in place for about five months, and the staff cannot even imagine doing their jobs now without it. Even though ILS' may not do exactly what we need them to do, it's nice to know that librarians out there are picking up the slack. So good job, Chris and Dean, and all other innovators out there. Anyone interested in meeting Chris in person can do so at the Computers in Libraries conference in Washington, D.C. - and I'll be there, too. Today I attended a demo for the content portal/federated search product called SchoolRooms. The short of it is that this is a SirsiDynix product designed to be the only information tool K-12 kids need when doing homework or looking for curriculum-related information. The long of it is that this tool has, as I count it, two primary functions. First, it is a browseable portal of selected web resources. "Selected" is emphasized here for two reasons. First is that these resources were selected because they were relevant to schools' curriculum, browseable by elementary school, middle school, etc (these are call "guides," and there are also guides for parents, educators and librarians, which focus on the curriculum, but from a "how to I help the kids" standpoint). All of these resources are websites freely available on the internet - which leads to the second meaning of "selected." To build this product, SirsiDynix worked with INFOhio and Kent State University's School of Library and Information Science (where I earned my MLIS) to bring together students, teachers, librarians and programmers. As a development team, these groups conducted exhaustive usability testing (read the report of their findings [pdf], lead by Jason Holmes) to make sure the product would be useful, useable and functional (for instance, they realized that the product would need to have a graphics-based K-2 interface, since kids that age can't read yet). Further, paired teacher/librarian contributor teams hand-select websites that are both reliable and relevant. These websites form the bulk of the content within the browseable section. If the browseable section isn't enough, SchoolRooms also functions as a federated search interface. 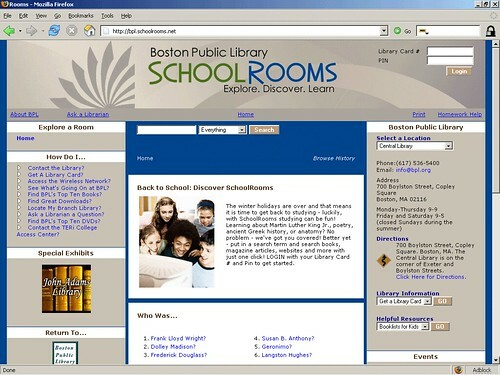 From one search box (on every page within SchoolRooms), patrons can search the library's catalog, all the library's subscription databases, all of the hand-selected websites, and lastly, the internet in general using Google (although this last one could be done by anyone, SchoolRooms has a nice built-in feature that helps people search better than they might if they were to go to Google themselves. For instance, if you were on the SchoolRooms page for "Elementary School > Geography > Maps > Africa," SchoolRooms will incorporate those keywords in the Google Search, which will yield better results than a freehand search, as a patron might not think to include all of those words). This demo session was lead by Kenneth J. Peterson of the Boston Regional Library System and the Boston Public Library. He point out that BPL is the first to roll this product out city-wide (although San Diego is not far behind, and Ohio is looking into state-wide implementation. Also, libraries in Canada and Denmark are interested). He was very excited about this product, especially coupled with BPL's eCard program. And to encourage use, there is a large link on the BPL homepage to their SchoolRooms portal. The bottom line seemed to be that this is a great product for K-12 homework help. In the usability study, it was found that 88% of students said they'd use it again, and 51% said it was more helpful than Google or Yahoo. That's a tool to keep an eye on - although I can't even imagine what the price tag would be. Today, my library consortium is upgrading from Sirsi/Dynix's Horizon 7.3 to 7.3.4. Which means, our catalog is unavailable to both the staff and the public. Which means, I've been brushing off my Dewey knowledge and helping people by memory rather than relying on a computer. Whew, I've worked harder today than I have in awhile. It's hard to realize how much you rely on something until it's gone. But the good news is that the library didn't come to a standstill just because the catalog is offline. People are still coming in for storytime, reserving museum passes, using the meeting rooms, using the computers, etc. It's a nice reminder that, even though they're right there on the shelves, people do a lot more here than just check out books. When our catalog software went down, so too did our online catalog. Which means that I can't do keyword searches unless I use a neighboring consortium's catalog (just to find the right call numbers). But what if a library's catalog records were open to the entire internet, instead of hidden away in the little boxes we call the catalog? To that end, I would like to congratulate Casey Bisson for his work with WPopac, and for being awarded the Mellon Award for innovative search software for libraries. This effort could make days like today a thing of the past. This is one small step for libraries, and one giant leap for patrons.